It has been a whirlwind of cake-making for these past few weeks. 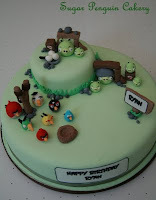 It started with the beautiful cherry blossoms-themed cake and ended with the Angry Birds birthday cake. Between taking care of the household chores, the kids, and the cakes, I was exhausted. BUT, on the other hand, I am very happy with all of them! 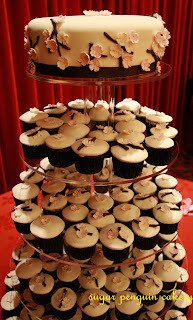 I love the simplicity of cherry blossoms that the bride picked for the theme. I cut more than 300 little flowers out of gumpaste, shaped, dusted them with edible petal dusts, and added dots on each one of them. The flowers stood out against the white background and some brown accents (ribbons and 'branches' out of chocolate fondant). 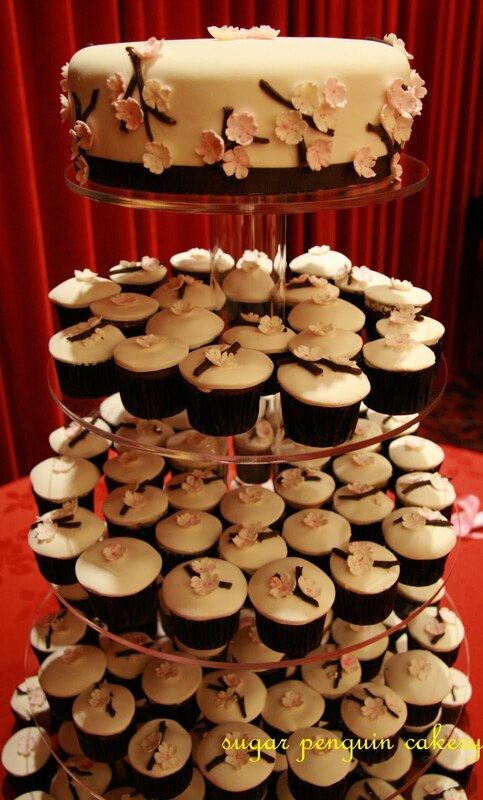 The cupcakes and the cake were displayed on a beautiful acrylic stand (available for rent, contact me for detail). My husband and I had a great fun at wedding reception, thanks to our wonderful Mom-in-law, who let us had a 'date night' and attended the reception while she took care of the rambunctious little ones. It was a fun night, lots of laughter, great company, and yummy feast! Just wanted to give a shout-out to our friends, RY, HS and FW who helped me to arrange the cupcakes on the stand in such pressed time. You guys rock!!! My darling niece, AK, turned one just a couple weeks ago. I felt an special attachment with her as my youngest son who is almost the same age as her and both of them born prematurely. Now who can resist of making cake for her?! 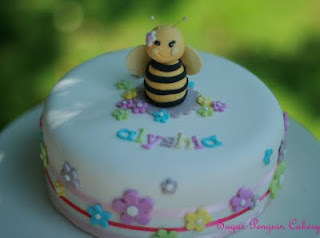 AK's Mom aka my sister-in-law chose a very darling theme for her, sweet bumblebee. Everything was so adorable and so sweet. I made only the top cake since AK's super Mom made the cupcakes for her. I helped by putting icings on the cupcakes since we're so pressed for party time. I felt like I was in a Cupcake Wars! Chaotic and crazy, but we made it! I am an avid fan of photography. I love looking at pictures and quite amazed with some of the talents out there. One of the talented photographer that I admired is Athalia's Photography. I've been following her blog and secretly wished that she can take another wedding pictures of ours... ha ha.. But for now, I was just hoping that she would take a picture of my cake. 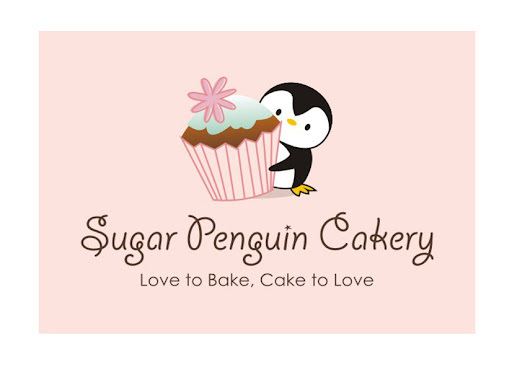 She did offered Sugar Penguin to be involved with one of the many amazing photo projects. Unfortunately, I was way too busy with my two kids at that time. But I promised her that I would love to be involved later in one of the projects. Finally she emailed me and let me know about her latest project! I was pressed for time, but I managed to make lots of tiny sugar flowers. 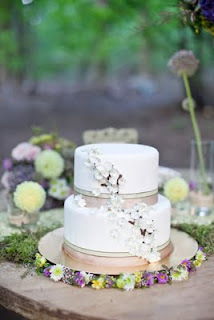 Again, I always think simple is best, so I came up with a very neutral, earthy cake. I started with gumpaste, cutting, shaping, forming, and dusting all of the tiny flowers. I can only do this after all of kids already sleeping. I was exhausted, but making these flowers were almost therapeutic. This photo is courtesy of Athalia's Photography. Speaking of therapeutic, playing Angry Birds also therapeutic. Ever since we got our new ipad, we jumped into the bandwagon of playing Angry Birds. We've been obsessed, and it's not good. I've managed to wean myself out of it and so far, it has been not quite successful. Oy vey. 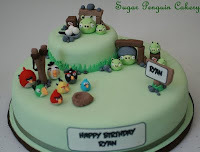 My dear friend, JK, was asking me if I can make an Angry Birds cakes for her son's 6th birthday. Of course, I said YES! Who could resist making those characters..?! Great thing, she gave me a sufficient notice for me to work on the characters modelling. I worked on the characters for about 2 nights, right after the 'tiny terrors' are all asleep. They're so adorable, I had such a hard time letting them go... haha. So there, my end of July/first two weeks of August experience.... Hope all of you enjoy looking at these photos and my ramblings, of course... Until then, off I go to prep the sugar flowers for an upcoming wedding with B & W theme color, CAN'T WAIT! Thank you so much, Ney-Ney!